Republic of Germany stamps issued during 1960 featured commemorative postage stamps and surtaxed pictorial stamps for charity. The two stamps shown above (Mi. #326-27, Sc. #807-08) were issued on April 7, 1960 to publicize World Refugee Year. The 20 Pf. denomination stamp shown above, at the left (Mi. #328, Sc. #809), was issued on April 19, 1960 to commemorate the 400th Anniversary of the Death of Philipp Melanchthon. Philipp Melanchthon (1497-1560) was a collaborator with Martin Luther, the first theologian of the Protestant Reformation, and the intellectual leader of the Lutheran Reformation. The 20 Pf. denomination stamp shown above, at the right (Mi. #336, Sc. #817), was issued on September 6, 1960 to celebrate the 1,000th Anniversaries of the Births of St. Bernward (960-1022), the Bishop of Hildesheim from 993 to 1022, and St. Godehard (960-1038), the Bishop of Hildesheim from 1022 to 1038. The 10 Pf. denomination stamp shown above (Mi. #329, Sc. #810) was issued on May 17, 1960 to publicize the 1960 Passion Play at Oberammergau, Bavaria. The two stamps shown above (Mi. #330-31, Sc. #811-12) were issued on July 30, 1960 to publicize the 37th Eucharistic World Congress, held in Munich. 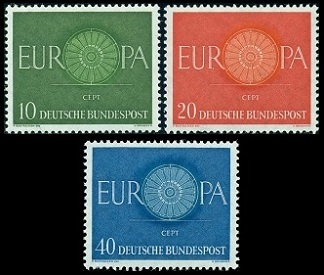 The four Federal Republic of Germany stamps shown above (Mi. #332-35, Sc. 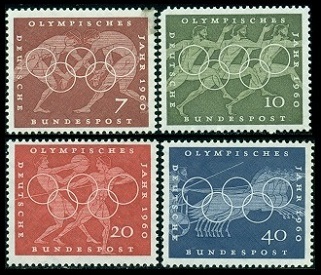 #813-16) were issued on August 8, 1960 to celebrate the Summer Olympic Games in Rome. The four designs feature ancient athletic competitions, as they have been depicted on ancient Greek urns. The three stamps shown above (Mi. #337-39, Sc. #818-20) were issued on September 19, 1960 to celebrate EUROPA (United Europe). The four surtaxed Federal Republic of Germany stamps shown above (Mi. #340-43, Sc. #B372-75) were issued on October 1, 1960 to benefit Public Welfare. 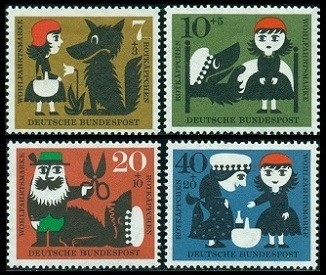 These designs feature scenes from the Fairy Tale, "Little Red Riding Hood", by the Brothers Grimm. The 40 Pf. denomination stamp shown above, at the left (Mi. #344, Sc. #821), was issued on October 15, 1960 to honor the memory of George C. Marshall. George C. Marshall (1880-1959) was an American general and statesman, famous for his leadership roles during World War II and the Cold War. He was the Chief of Staff (Five Star General) of the United States Army and the Secretary of State of the United States. His plan for the rebuilding of Europe after the war resulted in the Federal Republic of Germany eventually becoming the third rated economic power in the World. The 10 Pf. denomination stamp shown above, at the right (Mi. #345, Sc. #822), was issued on December 7, 1960 to commemorate the 125th Anniversary of German Railroads. The design features an early steam locomotive.